You want your wedding day to be perfect. You want everything to run smoothly, for people to have a good time, and to be able to celebrate with family and friends. You don’t want to hear that flowers could have potentially ruined your day, do you? If you listen to these three helpful suggestions you won’t have to worry about flowers having the potential to ruin your picture perfect day. Suggestion #1: Avoid Fragrant Flowers. Even though some flowers have such a strong, sweet scent, we recommend avoiding using them, or at the very least, using them sparingly. You may love the scent, but your guests may not. Some flowers have such an overbearing scent that it can give guests a headache, and some even have the potential to change the taste of your meal and cake if they are placed nearby. Suggestion #2: Avoid Flowers That Die Quickly. This seems fairly obvious, doesn’t it? If you are having an outdoor, summer wedding, avoid these types of flowers especially, since the hot sun blazing down on them will result in them dehydrating quickly. Suggestion #3: Avoid Flowers That Will Stain. Pollen is a particular culprit – and a pollen stain is very difficult to remove from a white wedding gown. Also, if you are using flowers that are artificially coloured, sometimes dyes may rub off onto your dress. If you must use dyed flowers just remember to avoid having them rest against your dress when walking up the aisle, standing at the alter, or posing for photographs. It seems a lot of our wedding traditions and customs stem from the attempt to eliminate any evil and bad luck that could arise within ones marriage. No one wants misfortune to lurk into their marriage, so perhaps by following some of these traditions you can avoid these evil spirits. Dating back to the Ancient Greeks and Romans, there are several unique wedding traditions and customs for brides and grooms to choose from; select the ones that make sense to you and abolish any that seem a bit far-fetched. Ivy is the symbol for everlasting love. Ancient Greek brides used to carry ivy at their wedding to display their never-ending love for their soon-to-be husbands. Meanwhile, Ancient Roman brides used to carry bunches of herbs to the altar, instead of wedding flowers, to symbolize fidelity and fertility. In the Victorian ages the bride would toss her bridal bouquet to a friend as she left her wedding. This tradition soon became popularized as “the single women who would next get married” if she caught the bridal bouquet. However, in the Victorian ages, the bride was simply sending her friend safety from evil spirits and to offer her luck. Modern society has taken this historical tradition and altered the meaning to fit into our cultural norms. The Victorians were also the ones who popularized the rose. They were fascinated with the meanings of different flowers and recognized the rose as a wedding flower represented true love. Both of these Victorian traditions are still popular in our North American ceremonies today. Traditionally, in Greek Orthodox weddings, the bride and groom wore crowns of floral orange blossoms. They believed that the blossoms symbolized virginity and purity since they were delicate and white plus they emitted a sweet, delicate scent. Bride’s dresses were even designed, with delicate embroidered flowers to match the fragile crowns that were worn. 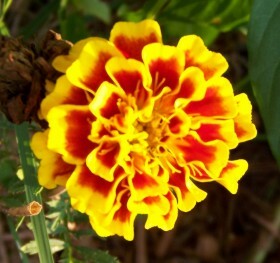 In Tudor Engla nd, brides carried marigolds that were dipped in rosewater as their wedding bouquet. After the ceremony they would eat the flowers because they believed that they were aphrodisiacs. More recent traditions include Thailand, where the mothers of the bride and groom drape puang malai, flower garlands, around the shoulders of the bride and groom in order to bring them good fortune for the rest of their lives. Meanwhile, in India, the groom’s brother sprinkles flower petals over the couple to protect them from evil spirits at the end of the ceremony as they begin their lives together as husband and wife. Also in India, the bride and the groom both wear floral headpieces throughout the ceremony. In the Middle East, Artemisia, a bitter herb, is included in the bride’s bouquet to ensure that the marriage is able to withstand bitterness as well as sweetness. Moving into Europe, particularly in Sweden and Holland, grooms sew small pockets of pungent herbs, like garlic, chives, and rosemary into their clothes to bring their marriage good luck. While in Italy, the front grill of the getaway car is decorated with flowers, to pave the road to a happy marriage for the bride and groom after they leave the ceremony. Although some of these traditions may seem a bit whacky to you, they all really emphasize the love and affection between two people who are getting married. As a result, consult your partner and see if there are any traditions you may want to include in your wedding to make your special day extra special. this year has been filled with beautiful weddings, including Mr. & Mrs. Kenneth Martin’s Wedding (BunchesDirect Customers). Mr. & Mrs. Kenneth Martin wedding was filled with beautiful elements, including a Model T. One of our favourite elements is that they stuck with a theme throughout the entire wedding. The red and white wedding flowers, pin-striped suits, the brides dress, hair, and make up; and even though it rained on their wedding day, the umbrellas added a whimsical touch to the ceremony. The bride and groom also chose to use two distinct rose colors through-out their wedding. While the bride held a beautiful red rose bouquet with woven bear grass throughout with a base of Aspidistra (called the Rose Wrap Wedding Bouquet), the groom wore a luxurious red rose boutonniere. The rest of the wedding party was paired with beautiful white roses. The men wore a classic white rose boutonniere while the ladies held classic white rose bridesmaid bouquets. We were extremely happy that the bride and groom truly loved their flowers and had a wonderful wedding day. Thank you Mr. & Mrs. Kenneth Martin for choosing BunchesDirect to be part of your wedding!